The 2019 LQHBA Yearling Sale will be conducted August 1 thru 3 at the Coushatta Casino Resort in Kinder, Louisiana. 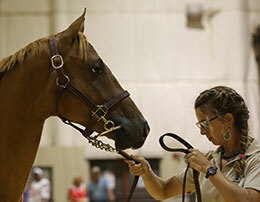 ALEXANDRIA, LA—FEBRUARY 12, 2019—Louisiana Quarter Horse Breeders' Associating announced dates for their annual yearling sale this week. The 2019 LQHBA Yearling Sale will be conducted again over three-days, August 1 thru 3 at the Coushatta Casino Resort in Kinder, Louisiana. Last year the annual sale grossed a record $6,672,800 for the 461 state-bred yearlings sold. "The average was up 22% and median climbed 14%," LQHBA Executive Director Tony Patterson said. All yearlings entered in the sale are paid to date in the association's rich $1 million dollar LQHBA Louisiana Million Futurity(RG1) conducted in December each year at Evangeline Downs. Last season's winner Mpshinning, a $27,000 LQHBA Yearling graduate, earned $445,000 for winning the Louisiana Million. A winner of six of eight starts, the son of All American Futurity(G1) winner Mr Piloto earned more than $591,000 at 2. A one-year ROI return of nearly 22%. He was bred by the 2018 AQHA Racing Champion Breeders' Jon and Donna McPherson. Consignment forms to enter Louisiana-bred yearlings in the 2019 LQHBA Yearling Sale will be available later this year. For additional information visit the association's website at lqhba.com or call 318-487-9506.